Due to the immense explosion of the cryptocurrency market, finding a good and reliable exchange platform has become harder than ever. The ever-increasing number of new customers from all over the world has caused many prominent exchanges to temporarily close the option of creating new trading account. Although the main reason is a necessary upgrade to existing functionality by migrating to more powerful servers, regulatory agencies are also starting to enter the volatile market, searching for evidence of price manipulations and illegal market operations. This not only affects newcomers who have less entrances to the market, but seasoned traders as well because they are losing faith in the industry. Because of that, opening an account with a trusted exchange has become quite a feat today. Fortunately, there are many more exchanges you can use without any limitations whatsoever. One of them is called Changelly. Unlike traditional exchanges, this one boasts a fairly different approach to trading. Instead of giving you classic trading platform interface where you can place offers, it automates the whole procedure by connecting to several renowned platforms and choosing the best deal for your conversion. But don’t get cheated by its simplicity – it boasts powerful tracking algorithms, multiple deposit methods and lets you be completely anonymous. Interested to hear more? 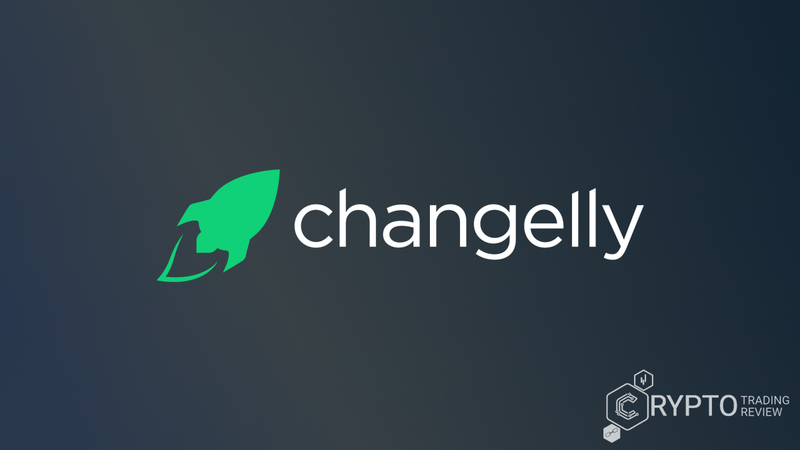 Stick around with us through our Changelly review and learn some valuable information before trading! Prior to explaining how Changelly exchange platform actually works, we will investigate the account creation procedure which is mandatory prior to actually using this application. Fortunately, the procedure is very short and simple, with several account creation options at your disposal. If you have an active Facebook, Twitter or Google+ account, you can simply link it to your new Changelly trading account. This will be done in a matter of seconds, and you’ll be instantly brought to the account dashboard. On the other hand, if you don’t have any of aforementioned accounts, or you simply don’t want to link them here, you can also provide a valid email address. You will then receive an email containing the personal details you’ve provided, as well as a password string that you’ll use for logging in. Bear in mind that you can always change it via profile settings, and you can also create additional security layer by enabling two-factor authentication. This is a highly recommended security procedure that requires an input of disposable 6-digit code generated by an application on your mobile phone. By turning this feature on, it basically ensures that no one can access your account if he doesn’t also possess your smartphone. That being said, be sure to make a backup of the application once you’ve downloaded it, in case your phone gets lost, broken or stolen, so that you can still be able to access your account. And that’s pretty much it when it comes to creating account here – simple, fast and painless. Oh, and if you change your mind, you can link your social media profiles to your Changelly account at any time. Now, let’s take a look at another really important feature of every top-notch exchange platform – speed. Stick around and discover unbiased facts! Regardless of your trading capability and ability to recognize good investment opportunities – if your trading tools are of low quality, you’ll fail to catch many great, yet short-lasting offers. That’s why platform speed and responsiveness are some of the crucial factors in trading in general, and especially when it comes to cryptocurrency trading. Due to the extreme volatility of the market, seconds can make a huge difference, and if your trading platform tends to become sluggish from time to time, you just might miss a great trading opportunity or, even less, lose a significant amount of money. Fortunately, Changelly isn’t that kind of exchange. As per their FAQ section and our first-hand experience, all offers requested by clients are instantly sent to the exchanges, and the sole procedure of currency conversion generally lasts between 5 and 30 minutes, depending on the current state of the network. However, there are some key factors that impact the general speed of transactions, which are tied to the blockchain technology as such and can’t be improved by this exchange in any way. For instance, some services might generate a distributed denial of service or DDoS attack on the certain blockchain, which renders the network unresponsive until the attack is canceled. Also, there are cases when cryptocurrency experiences significant software update or when the blockchain is being split into two, causing the creation of completely new cryptocurrency. 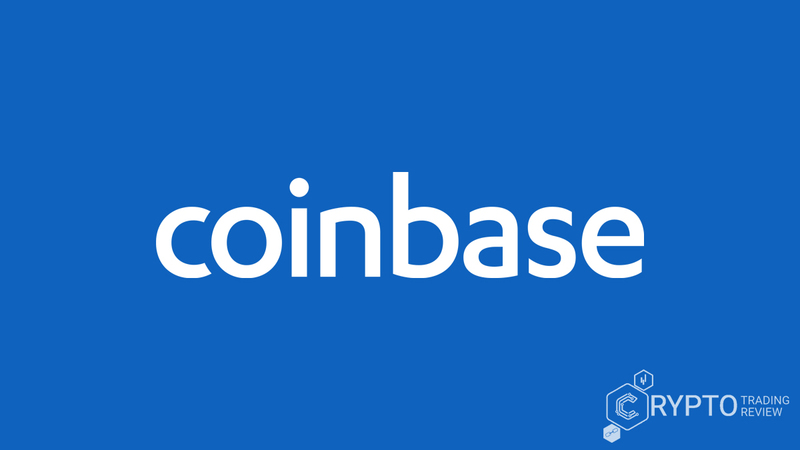 This procedure is also known under the name hard fork, and it already happened several times before, spawning currencies such as Ethereum Classic, Bitcoin Cash and Bitcoin Gold. During this period, a network might become slower, which could result in negative conversion performances. However, the most common factor that makes transactions slower is the congestion of the network due to the overwhelming number of transactions waiting on confirmation. 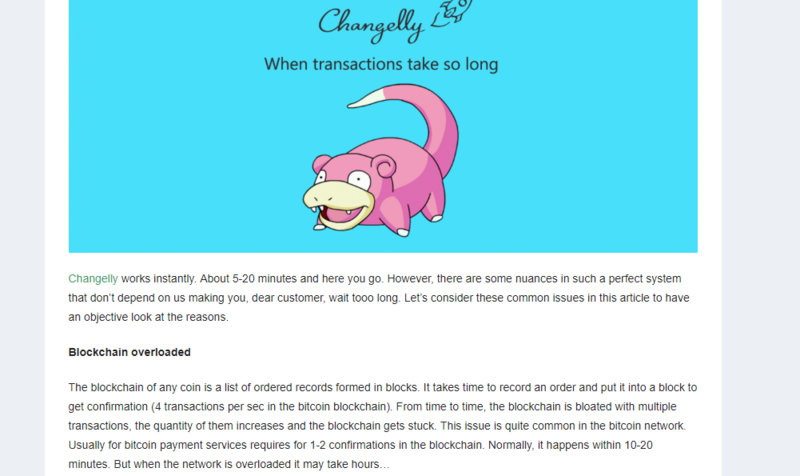 Once again, all the mentioned factors are specifically tied to the underlying blockchain of the selected cryptocurrency, and Changelly can’t speed up the process in any way. In the events like these, patience is a virtue – just relax and wait a bit more, and funds will surely be reflected in your wallet. So now we know that the platform itself is really fast, and that registration procedure is lightning fast. However, we still don’t know how the platform operates, do we? Well, that’s about to change, since the next section will give a thorough overview of the exchange principles of this platform. Keep reading our Changelly review and learn all you need to know! Since a fairly high percentage of newcomers to the world of crypto are highly inexperienced traders looking for a quick profit, the importance of education has never been higher. Therefore, prior to diving into the explanation of platform principles, let’s give a brief “Crypto 101” course where we’ll explain the core concepts and terms. Although cryptocurrency trading is in fact pretty much identical to trading regular indices, stocks or other assets – swapping one for another for a market-dictated price – due to the existence of blockchain technology, there are some differences. Main ingredients of each cryptocurrency are two very specific strings of random numbers and letters, named keys. Public key is your address for receiving specific cryptocurrency and is generally compatible only with that one – you can’t, for instance, send Bitcoin to a Litecoin address. Private key, on the other hand, lets you access and transfer funds contained on the corresponding public key. It is crucial to keep your private key safe – if you lose it or accidently give it to someone, you might permanently lose access to your funds, without any chances of saving them. In order to exchange your existing fiat money for cryptocurrency, you’ll need to deposit your funds to one of many available exchanges. After the deposit is processed and approved, you simply swap your existing funds for a certain amount of chosen cryptocurrency, based on the amount you wish to invest and the available trading pairs. Upon receiving your desired cryptocurrency, if you plan to keep it long-term and not keep on trading on regular basis, it is recommended to withdraw them to a wallet. It denotes a software, hardware or a piece of paper containing your private keys, thus giving you full ownership over your crypto coins. Only by having total control over your private keys, you can be sure that your funds are completely safe. When trading through common crypto exchanges, you don’t actually “own” your coins, since private key is kept by the exchange itself, which makes any possible security breach a potential catastrophe for regular clients. However, trading with Changelly doesn’t expose you to these kinds of risks, since the core principle here is much different. To put it in the simplest form possible, Changelly serves as a mediator between you and classic exchange platforms. Let’s use a simple example to explain how this works in practice. Say that you have a certain amount of Ethereum, let’s say 10 Ether, and you wish to exchange it for Monero coins. You’ll need to provide public address of your wallet that contains a certain amount of Ether, as well as an active Monero address where you want your new coins to be transferred. After that, the advanced, in-house developed API of Changelly will check current market prices for your desired trading pair. This happens in a matter of seconds and, once information for respectable exchanges such as Bittrex and Poloniex are collected, Changelly automatically compares them and selects the best offer for you. It then provides you with exchange information, giving you the amount of input and output currency, minus some fixed Changelly fees. If you agree on the given numbers, the exchange procedure is triggered and then the platform does its magic. First, all your Ethers are converted to Bitcoin in order to meet the trading pair of a chosen exchange platform. Then, converted Bitcoins are sold for Monero, by meeting the agreed price. The moment the exchange is finished, Monero coins are instantly sent to the provided public address, and you should see them reflected on your Monero wallet in no more than half an hour. However, as we have already talked here, there are some circumstances when conversion time might be prolonged, but these are related to the cryptocurrency itself, not this exchange. Now we know how the exchange procedure works here. However, some key features are still waiting to be explained – for instance, available deposit methods. Stay with our Changelly review to learn how you can start trading here by making your initial deposit! Fortunately for newcomers, even though this platform is dedicated to quickly exchanging between a multitude of cryptocurrency, fiat deposits are supported as well. In other words, if you still don’t have any crypto coins, your personal debit or credit card will do just fine. Visa and MasterCard are fully supported by the platform, and the deposit procedure is extremely simple. You are asked only to specify the amount of dollars you wish to invest and to provide your card details. Furthermore, depending on the cryptocurrency you wish to acquire, you’ll have to create a dedicated wallet address for receiving your new coins after the conversion process is completed. The moment you agree on the conversion numbers, the procedure will commence, and you’ll have your brand new crypto coins in no time. On the other hand, you can use many popular cryptocurrencies to make deposits, as well. All cryptocurrencies present on the Changelly platform have a two-way conversion support, meaning that all of them can be either input or output of a conversion process. The process here is also as simple as it can be – instead of providing your card information, you’ll be requested to specify the amount of your depositing cryptocurrency you’d like to exchange, public address of your wallet, as well as public address of the destination wallet. Upon accepting the offer, the already explained conversion procedure begins. As for the available cryptocurrencies, we strongly believe that this offer is the best one out there. Apart from the most recognizable market leaders, such as Bitcoin, Litecoin, Ethereum, Ripple and Dash, a palette of others is present, too. Here you can also find some interesting and trusted game-changing projects such as Factom, Lisk, Ardor, Waves, Golem, Stratis and many others. Furthermore, due to the extreme quality of Changelly development team and their eagerness of indulging their vast community, new coins are being added as soon as they are registered on major exchanges. This means that our Changelly review also has to mention some new and interesting projects such as Viberate, who aims to disrupt music industry and bypass major labels, and Power Ledger, a brand-new Australian project of making a decentralized network for trading electricity. It is safe to say that the platform truly offers a lot to its customers, with the service being absolutely fantastic. However, remember that we’ve said mentioned Changelly fees earlier? Let’s see what they mean and how much do they cost. Upon attempting to make a conversion using this platform, in one moment you’ll be presented with an overview of results of your exchange process. It will show the number of coins you want to exchange, the number of coins of the selected cryptocurrency you’ll receive after the conversion, as well as the amount of fees you have to pay. There are several separate fees that are combined here – let’s give a brief overview of them. The moment the exchange process is engaged, your funds are sent to the chosen exchange. Depending on your chosen deposit method, you’ll have to pay either processing and network fees to buy Bitcoin with your fiat deposit, or network fees in order to move your crypto to the exchange and buy Bitcoin. After buying Bitcoins, you’ll have to pay platform fees in order to sell it for other cryptocurrency of your choice. Finally, you’ll have to once again pay the network fee in order to transfer your new coins to the wallet address you’ve provided before triggering exchange procedure. These are all mandatory fees that you will have to pay when going with the conventional trading approach, but Changelly does it all instead of you. Furthermore, thanks to its lightning-fast trading robots that collect crypto prices in real time and compare them, you can be sure that this platform will always bring you the best deals. That being said, the fixed fee of 0.5% that Changelly charges for its services is really not much, considering the effort and time it saves you. Also, the information given to you before agreeing to continue with exchanging your coins is final – you don’t have to worry about stumbling upon some extra fees. However, this Changelly review is still not complete, as we have to introduce to you the ingenious support team and some interesting tools that you can use for free. Read on! Regardless of the platform features and safety, it’s always good to have someone watching your back in case anything out of the ordinary occurs. That being said, we’re happy to state that Changelly is aware of that fact, and that’s why you’ll have nothing but an extremely pleasant trading experience here. Fortunately, if anything suspicious happens, you’ll have exactly the same treatment from the company’s customer support team. There are two ways of getting in touch with them – by sending an email, or by filling out the contact form on the company’s website. The latter one enables you to input some additional information such as cryptocurrency that you’re experiencing problems with, and you can also attach a transaction ID in order for customer support team to get to the bottom of the problem as quickly as possible. During the tests made for the purpose of this Changelly review, we’ve made several inquiries regarding various topics, and we must state that our personal experience with this team has been nothing but delightful. This team is consisted of highly capable experts in the fields of finance, customer care and investment, so all your problems will surely be resolved in a professional manner. Aside from exchange functionality, Changelly offers some interesting additional features. One of them is the affiliate program, where you can refer new customers to this platform and earn 50% of the revenue the company gets from your referrals. There are several ways of promoting Changelly online – you can use direct referral links or engage future clients in a catchier manner by utilizing various banners and animated widgets and placing them on your website. You can convert your earnings to either BTC or ETH once you collect enough value. Your affiliate account is linked to your trading account, so you don’t have to generate another password. Furthermore, there are custom widgets that you can modify and place on any website you administrate or own. Call-to-action modal buttons are also available, giving you more than enough options for attracting future users of Changelly exchange platform. Developers will be delighted to hear that the company has provided and extensive API documentation. Everything is explained in detail, with additional links pointing to other key repositories and useful pages, mainly on company’s GitHub profile. From the documentation, you can use how to create requests for retrieving list of transactions, currencies, creating new wallet addresses and transactions and much more. By utilizing the power of this API you can use its functionality in your own applications for free, and also modify it to completely meet your needs. And finally, due to the extremely community-inclined business model of Changelly, you can propose a coin to be added to the platform. This is done by submitting a simple Google Docs online form, where you’re required to state why your coin should be added to the platform. If your arguments are valid enough, your proposal might get accepted by the company! And that’s about the end of this Changelly review, so now it’s time to give some final remarks. As this extensive Changelly review has clearly proven, this company has provided a unique, all-around solution for both newcomers and seasoned traders looking for a fast way of converting cryptocurrencies without the need of accessing the full-fledged trading platforms. By utilizing powerful trading bots, this exchange is able to determine the best price at any given moment, ensuring the cheapest deals for you. The overall quality of the interface is great, as is the security and responsiveness of support team. Reasonable fees paired with multiple exchange pairs including more than 40 popular cryptocurrencies are a guarantee of fantastic service. All in all, Changelly is a great way of entering the exciting crypto marketplace, and we can wholeheartedly recommend it. 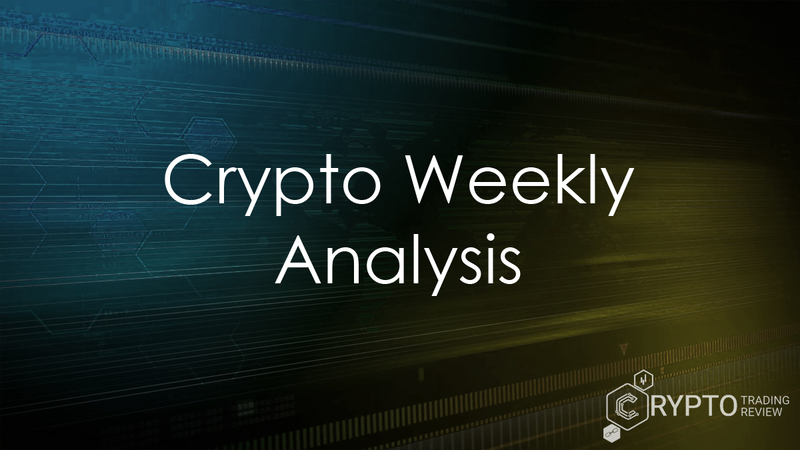 Be sure to check out our coming articles, as we’ll be dealing a lot more with other crypto-related topics and news. But for now, though, open an account here and let Changelly be your ideal trading partner!